This practical handbook takes the guesswork out of professional learning, showing school leaders how they can build a self-improving culture and remove barriers to learning. David Weston and Bridget Clay set out their advice for how every school can bring in the best ideas from the whole system, and make sure that these have a lasting effect in the classroom. 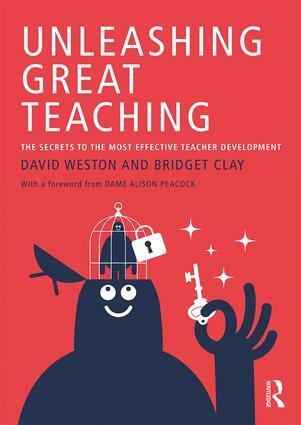 Packed full of examples, easy-to-use ideas and checklists, Unleashing Great Teaching brings together a vast body of experience gained by the Teacher Development Trust (UK), and shows how other schools can learn from these insights. From fostering a culture of evaluating impact to establishing good relationships, communication and a developmental culture, this book takes each and every aspect of the school system and reassesses its role as a driver of teacher and student success. An invaluable resource for leaders at any level within the schooling system, Unleashing Great Teaching will open doors and inspire leaders, teachers, students and communities to learn about learning. "Unleashing Great Teaching is a remarkable book. It combines research on adult learning and the authors' hands-on experiences of working with schools to produce an accessible, practical, and at times entertaining 'how to' for improving teacher learning. Should be on the desk of every school leader in the country (if not the world)." "This book provides a valuable insight into the world of ‘school’ and the many different layers of learning that take place. From leaders to teachers to pupils, it delves into what is effective and works best in a variety of schools. It discusses topics that are sometimes forgotten such as the culture of a school and ‘cultivating a culture of learning’ that applies to both staff and pupils. As a current member of SLT, I have found this book to be an insightful window into how schools could operate if senior leaders ran through the same processes that Weston and Clay describe in great detail. It is a book that I will be sharing with my fellow colleagues and one that I will return to again and again." "Unleashing Great Teaching is packed with insights for school leaders and teacher-educators, drawn from extensive experience in the field. These include a helpful summary of the common pitfalls when using research to inform professional development, a detailed consideration of developing support staff, and advice on how to apply cognitive science to teacher learning at both a macro and a micro level." David Weston is the Founder and Chief Executive of the Teacher Development Trust. In March 2015, he was appointed by the Department for Education as Chair of the Teachers’ Professional Development Expert Group. Bridget Clay is currently Head of Programme for Leading Together at Teach First, and was previously Director of School Programmes at the Teacher Development Trust, the national charity for professional learning in the UK. Looking to purchase Unleashing Great Teaching in your school? We offer discounts for schools when purchasing in larger volumes. To discuss these options please contact Louise Perrier.